Before you let loose your development team, you’ll want to set up a project for them to work on. Click on Projects (at the top), then on New Project. 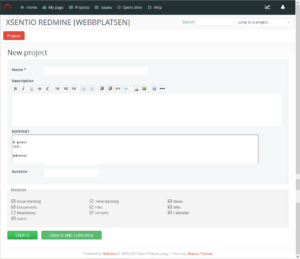 Identifier – This is used internally by xSentio Redmine (including URLs). Once you have saved the project, you can NOT rename the Identifier. TIP! Use a prefix (customer_xxxxx) if you think you will create more projects that concern one and the same customer. Homepage – The link you enter here will be displayed on the project overview page. Public – If you select the box, the project can be viewed by all users, including those who are not members of the project. Trackers – Select which file types should be available when the cases are categorized. If more or different file types are requested, the administrator registers this. Modules – Modules are additional features that you can choose to use when creating a project. They will help you keep track of the project and the ability to connect to valuable information that belongs to the project. Members – Search for the users who will be included in the project and give them an appropriate role. It is also possible to add a whole group to a project. Versions – With versions, you can categorize a project based on its different phases, such as start-up phase, analysis, execution, testing, and launch. These different phases / versions will then be found as a list of the project map (Roadmap). You can also link to a page in the wiki to a version / phase. Case categories – With case categories you can get your cases sorted in one and the same project. The case categories are only visible in the project they are created in. Examples of useful case categories to create may be to mark something as ‘internal’ or something that concerns a ‘customer’. Wiki – Each project can have its own wiki. Here you can collect your internal knowledge bank with useful information for all project members. Version archive – When the version archive is enabled, you can see the various changes that have been made to a text. Forum – Each project can have one or more discussion forums where the group can discuss, ask questions to other project participants, etc. Activities (time tracking) – Categorization of different types of activities to choose when reporting time for a case. Reporting time in a case is done when the case is updated at Log Time.